At the INTERZOO in Nürnberg I presented my coral plant at the stand of the Schuran company. My exhibited aquarium, a 130 litre plexiglas basin with Skimmer- and filter technology by the Schuran company attracted a lot of attention, because it is occupied by fish and corals since January. 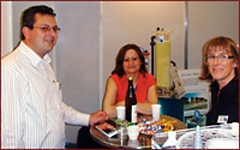 At the fair I could inform myself in detail about biological filter, lime reactors and skimmers from company Schuran. They did not only convinced me with the quality of used materials but also with their functionality. I could establish many interesting contacts. Among others I met Lars Sebralla, the developer of micronutrients which I use in my breeding plant. During many discussions he gave me important tips that will have a positive effect on the colours of my corals in the future.